My Fiona in Vindictus has a hammer now that is like an extended Mjolnir with a Loki helmet on top. They’re kinda smooshed together but nevertheless smashing things with it is quite fun. my silly lvl 44 Evie, Orsa. She is wearing the daily – 3 hour – war supplies item thing. The whole temptress set with some 10+ staff. ah yes, it does wonders and I dread trying to get to these legit items on my own soon. given i cant’ get monies off lower level dungeons anymore. A spoon! Hoorraaay!! A spoon! Orsa is proud of herself and her cooking! Orsa is very happy she has a spoon. Oh Vindictus, OH YOUUU. oh, Vindictus, you so mad. the insider joke was that Orsa was on her way to Silent Hill when the carriage broke down ( the horses got mauled by CREATURES) and then Orsa got hit by another carriage. 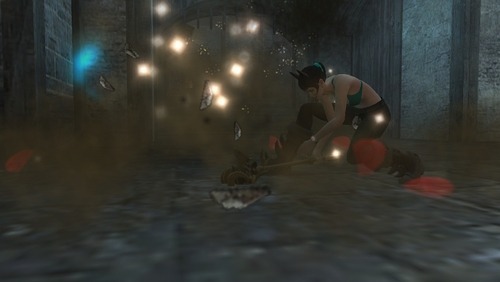 if you are wondering how Silent Hill and Vindictus could play ‘nice’ is very simple, take a gander-hoot at Silent Hill’s celtic tomfoolery in Silent Hill 3. Vindictus deals with celtic mayhem. mix and match! MIX AND MATCH. take Ainle for example! imagine a scenario of Silent Hill takin place in Ireland or Wales. ahahahaha! My Evie, Orsa, is doing that Thriller Dance with another Evie. As much as I like my Professional Arsonist title I also want one for my violently fanatic use of Ice Blast and Ice Spear. given that Aomi LOVES using ICE and LIGHTNING based attacks. Orsa using her crotch to blast out sparkles and kill Black Scar.. or whatever that jerk’s name is. this is the theme that plays in the Two Pumpkins mission/quest. it was a three evies and three fionas RAGE RIOT. THIS IS AOMI TRYING TO CHALLENGE PYRAMID HEAD. of course she became CUBE HEAD.